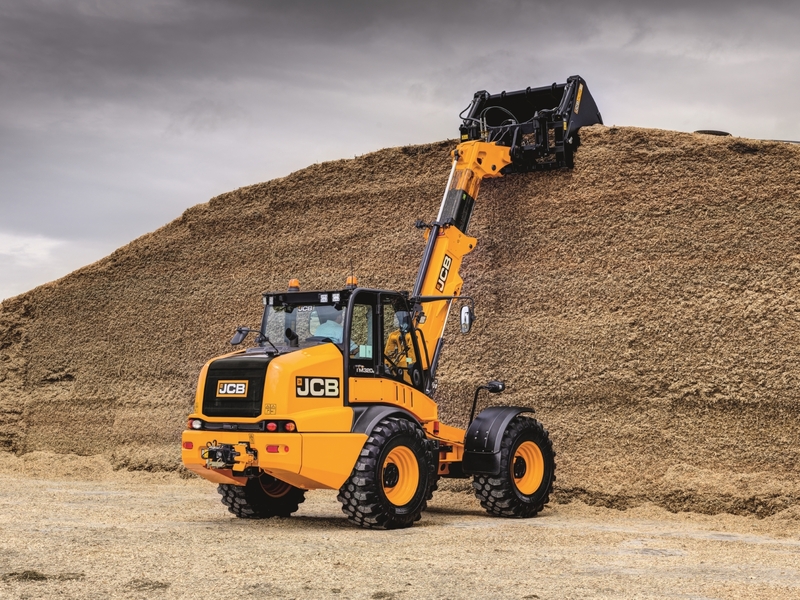 This year’s Grassland & Muck Event – being held May 24th and 25th at Stoneleigh, Warwickshire – will see the UK debut at a working event of the new JCB TM320S AGRI wheeled loader in its latest form. The high central driving position and great all-round visibility of the JCB TM320S Agri will be clearly demonstrated as it handles bales on the McHale working plot. 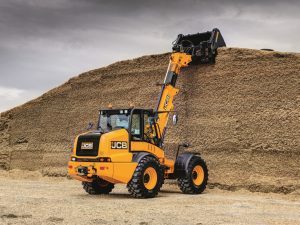 Improved ownership costs and operator experience have been in focus for the latest round of upgrades, alongside installation of the 108kW (145hp) JCB EcoMAX engine to Euro Stage IV / US Tier 4 Final emissions specification with SCR but no DPF. Performance is unchanged – the machine lifts a 3200kg load to 5.2 metres and supports 1750kg at 2.95m forward reach. But improvements include graphite impregnated bronze pivot bearings that extend the greasing schedule from once a day to every 500 hours, which matches service intervals for the engine (after the initial 100 hour service), four-wheel drive prop shaft and chassis articulation joint, which also now uses the new self-lubricating bearings. Cylinder end damping for boom extension as well as retraction and lowering further refines the operator experience, while additional work lamps for the LED lighting option make life easier when the machines are operated in dark yards and buildings. A larger right-hand rear three-quarter window improves visibility from the cab, where the air conditioning filters have been doubled in size to extend the service interval. A dedicated storage box installed in the right-hand footwell provides a secure location for tools, couplings and other equipment. Daily checks for engine oil, coolant and washer fluid levels no longer have to be performed outside the machine as they are part of the start-up procedure displayed on a new full colour instrument panel that provides information and warnings in a clearer at-a-glance format. An improved control arrangement makes the auxiliary hydraulics service more intuitive to use; for example, the in-cab switch for the pressure venting valve – which makes it easier to connect hose couplings on JCB AGRI attachments such as fork and bucket grabs – shows when this feature is available and a buzzer sounds as the hydraulic pressure is reduced.